Vida Stabler currently serves as the Title VI / Umóⁿhoⁿ Language and Culture Center Program Director and the Teachers of Umóⁿhoⁿ Language Facilitator. 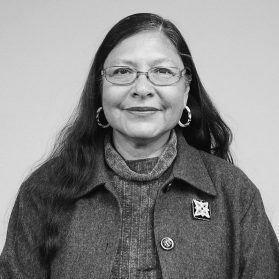 She received her Associate of Arts in 1993 from the Nebraska Indian Community College and her Bachelor of Arts in Education in 1995 from Wayne State College in Nebraska. She further refined her knowledge of Native education at Oklahoma City University, receiving a Masters of Education Degree in 1996. As an Umóⁿhoⁿ tribal member, Vida brings her expertise to Umóⁿhoⁿ education and revitalization of the Umóⁿhoⁿ language. Under her tenure as Director of the Umóⁿhoⁿ Language and Culture Center, Vida has introduced an Umóⁿhoⁿ curriculum development project which, in partnership with The Language Conservancy, will host and Umóⁿhoⁿ-Póⁿka Summer Institute and publish a Level 1 textbook in 2017.